Kathy White: Kits - You Asked For It! We finally did it. 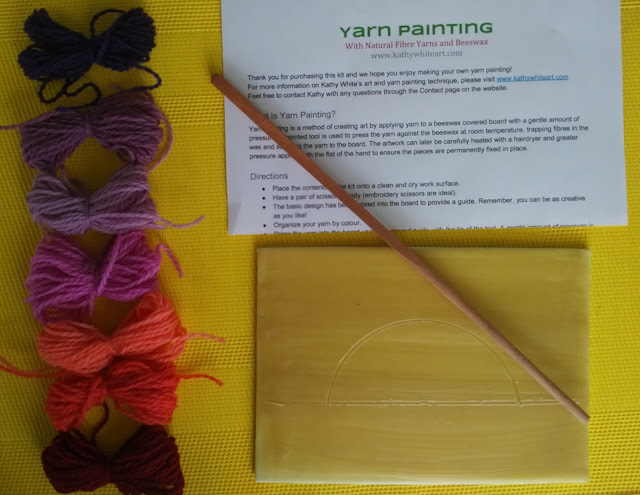 Yarn Painting Kits available! Please don't hate me. I know this is an unpopular sentiment in the bastion days of the multi-gendered, multi-racial, multi-generational, and multi-species Super Team. I can't help it. I am, and have always been, an introverted loner prone to hermit-like behaviour and quite happy that way so please go away now and stop knocking on my turtle shell. Last week, watching my husband apply beeswax to canvas panels more smoothly than I had managed in ten plus years of practice, I confessed that I am starting to see the benefits of applying multiple minds to a subject. You would think I'd be able to settle gracefully into aging without having to learn new things, but apparently not. Sheesh. Kit contents - Instructions, application tool, prewaxed and stamped board, and a lovely selection of wool yarns. Different colours in each kit! You guys asked me for kits. At Vogue Knitting Live!, you asked me for kits. 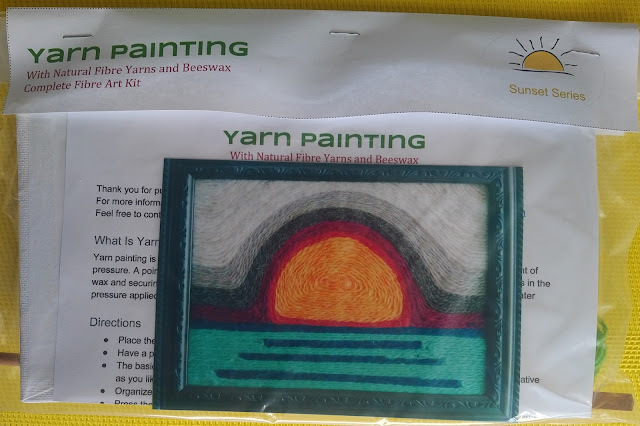 At the Waterloo Region and Beyond Quilt & Fibre Art Festival, you asked me for kits. In my summer workshops, you asked me for kits. "Kits?" I thought. "That's a great idea. But I'm busy making art. I don't have time now." Doug, however, saw the genius in this and decide to jump in and make it happen. So he did and did and did, and between your great idea and his large effort, these kits are a triumph of group work. The original Sunset design in the making. 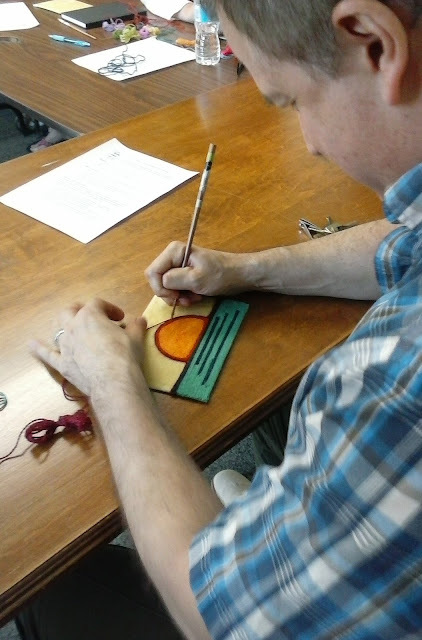 The sunset design is a tribute to Doug, modeled on his first workshop piece made almost a year ago. It is a simple design that offers a little guidance but allows for big creativity and everybody's version will be unique. The kits are just $20 each and are available now at the Silo Weavers. I will also have some at my workshop in St. Jacobs or, if you're interested in ordering some online, email me. 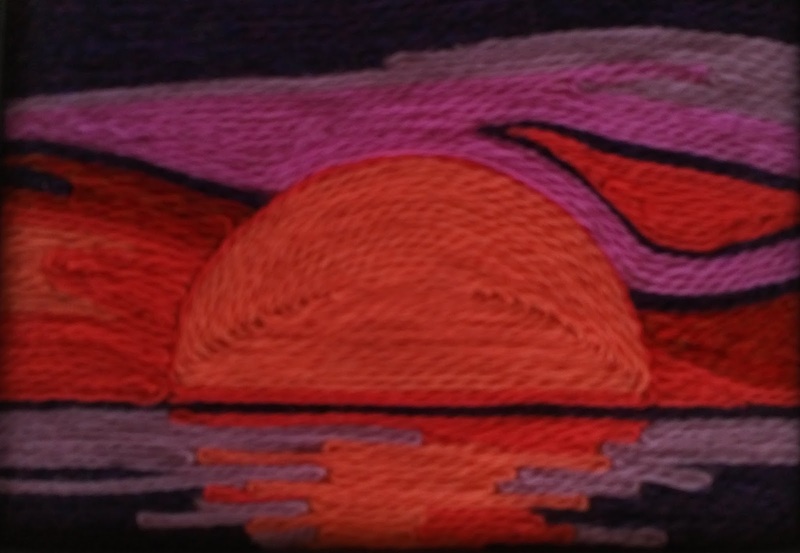 Kitty's Sunset - What I created with a Sunset Kit. We are excited to see what you make with the kits. Send us a photo of your completed Sunset Kit and we will post it. Thanks, Doug, and thank you for making this happen!